The State’s IEP form should assist districts in ensuring they have included all the required considerations and documentation in a student’s IEP. However, for an IEP to be appropriate, the Committee must be aware of the guiding principals that are fundamental to developing an appropriate IEP for a student. The IEP process is a child-centered process and should focus on how the student learns. No other issues, agendas or purposes should interfere with that process. 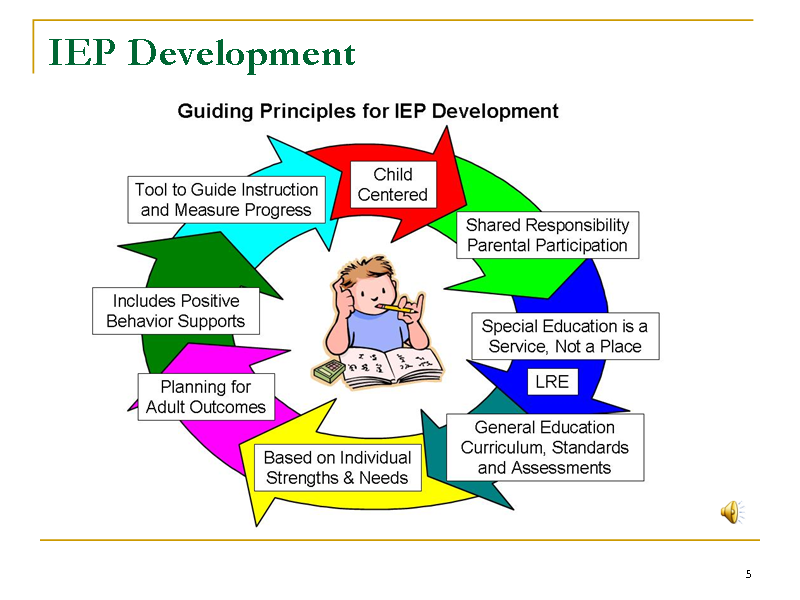 Parents must be involved in the IEP development process as equal members of the Committee. Information provided by parents regarding their concerns for the education of their child must be considered (they must be discussed and documented) in the IEP development and review process. Federal law requires that special education service be provided in the least restrictive environment (LRE). LRE means that placement of students with disabilities in special classes, separate schools or other removal from the general educational environment occurs only when the nature or severity of the disability is such that even with the use of supplementary aids and services, education cannot be satisfactorily achieved. Throughout the IEP development process, meaningful consideration must be given to opportunities and appropriate accommodations, program modifications, and services necessary for the student to participate with students without disabilities. The Committee must identify and address the impact the student’s disability has on participation and progress in the general education curriculum. General education curriculum means the same general education curriculum as for students without disabilities. In developing IEP recommendations, the Committee must consider the student’s strengths as well as his or her needs. For students beginning with the first IEP to be in effect at age 15, the student’s post-secondary goals must be a guiding consideration in IEP development. Throughout the IEP development process, the Committee must discuss and document how the recommendations, including annual goals, special education services and coordinated transition activities will incrementally prepare students to achieve their goals for adulthood. For students whose behaviors impede their learning or that of others, the Committee must consider positive behavior supports for the student during discussions and IEP development. One specific role for the general education teacher of the student with a disability is to assist in the determination of appropriate positive behavioral interventions and supports and other strategies for a student. The IEP should be written so that it can practically serve as an instructional blueprint and the basis for reporting on student progress. The individual needs of a student are determined by a Committee upon consideration of the present levels of performance and expected learning outcomes of the student. For students beginning with the first IEP to be in effect when the student turns age 15, post-secondary goals and transition needs are identified. Goals are identified that the student is expected to achieve during the school year the IEP is to be in effect. The Committee then makes recommendations to provide the student with the needed special education services, accommodations, modifications, and other supports to assist him or her to reach those annual goals. Recommendations include documentation of the decisions of the Committee to provide such services to the maximum extent appropriate in regular classes and settings with the student’s nondisabled peers. The final decision of the Committee is the identification of the least restrictive placement where the student’s IEP can be implemented. The IEP is the tool that ensures a student with a disability has the opportunity to participate and progress in the general education curriculum and is provided the appropriate learning opportunities, accommodations, adaptations, specialized services and supports needed for the student to progress towards achieving the learning standards and to meet his or her unique needs related to the disability.